Yes, we so often focus on first and last days of filming, but there’s so much that happens before the actors even get to set, and still more after they leave. It would be a dream to watch John Williams and the orchestra working on any Star Wars score. 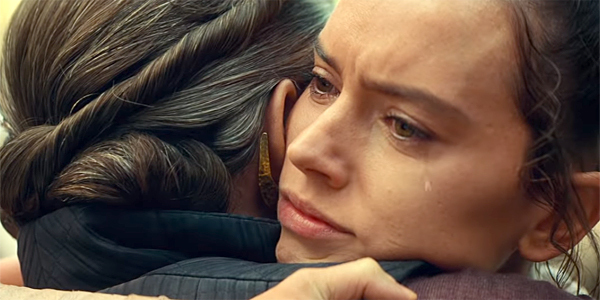 There’s a lot of hugging in the Star Wars galaxy, and you’ll probably remember the Rey/Finn/Poe hug photo J.J. Abrams shared on February 15 to mark the official end of Episode IX filming. Thanks to his new interview with Jake Hamilton at Star Wars Celebration 2019, we have more insight into how J.J. Abrams was feeling that day. We’ll be hearing a lot more from Abrams and the cast as we get closer to The Rise of Skywalker‘s release. Once the movie opens, we’ll hear even more from J.J. Abrams as he explains the decisions that were made along the way. He had to do a lot of that after The Force Awakens, just as Rian Johnson did after The Last Jedi, and George Lucas has had to do for decades now, especially after the prequels. Fans love Star Wars films, but they also feel so passionately about them — well, you know. © 2018 Celeberazzi All rights reserved.